Northern Arizona Normal School opened its doors on September 11, 1899 with twenty-three students, one professor, and two copies of Webster’s International Dictionary bound in sheepskin. Today, NAU’s diverse enrollment ranks in the top 4 percent of schools and colleges in the nation. NAU serves approximately 25,000 students statewide; the full-time faculty number 800 strong; and the Cline Library provides access to 1.5 million items and over 25,000 journals. 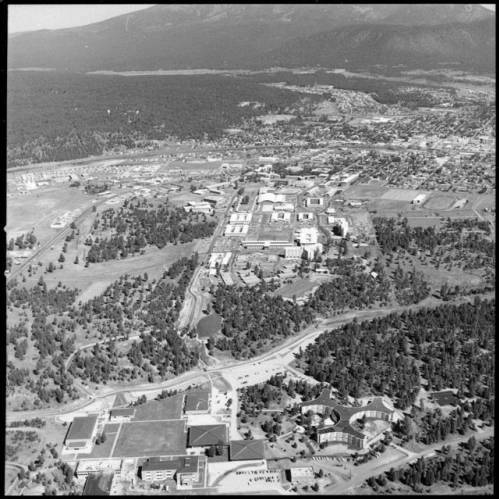 Special Collections and Archives (SCA) houses a wide range of information related to over 100 years of the history of Northern Arizona University, going back to its founding as Northern Arizona Normal School in 1899. As the official repository of all non-active records of the university, SCA maintains over 500 linear feet of administrative and historical records (documents, photos, films), as well as numerous publications written about the institution over the past several decades. There are even a wide number of oral histories from individuals connected to the institution. Click on any of the tabs above to learn how you can get started with your research!